Alessandro "Billy" Costacurta (Italian pronunciation: [alesˈsandro ˈbilli ˌkɔstaˈkurta]; born 24 April 1966) is an Italian football manager and a former professional defender, who usually played as a Centre back. Throughout his club career, Costacurta spent over twenty years with Milan between 1986 and 2007, as well as a brief season-long spell on loan at Monza. He is best known for his role alongside Franco Baresi, Paolo Maldini and Mauro Tassotti, forming one of the greatest defences in Serie A and European football during the late 1980s and 1990s, under the success of managers Arrigo Sacchi and Fabio Capello. He mainly operated as a central defender, and was a leading exponent of the position, receiving International acclaim, winning 7 Serie A titles and 5 Champions League/European Cup trophies throughout his career, along with many other trophies. Costacurta retired from professional football at the age of 41, on 19 May 2007. In his final match for Milan, he scored a goal from a penalty in a 3–2 defeat against Udinese, becoming the oldest goalscorer in Serie A. Along with his Milan teammates, Costacurta was also an important member of the Italian national side during the 1990s. He made 59 appearances for Italy, scoring 2 goals, and he participated in two World Cups (in 1994 and 1998), as well as a European Championship in 1996. With Italy, he managed to reach the 1994 World Cup Final, which was lost against Brazil on penalties. Alessandro Costacurta was affectionally known to his fans as "Billy", due to his thin physique in his youth, and his notable skill at basketball (as the local basketball team of Milan, Olimpia Milano, was referred to as "Billy" during the late 1970s, the team's main shirt sponsor). Originally a Milan youth side product, during his professional career Costacurta would go on to play for the senior club for over 20 seasons, after a brief spell on loan at Monza in Serie C1 during the 1986–87 season. Costacurta was already a young member of the senior squad during the 1985–86 season, but failed to make a single appearance. Before being sent to Monza on loan, Costacurta would make his Milan debut in the Coppa Italia during the 1986–87 season, but would not make his Serie A debut with Milan until the following year, under Arrigo Sacchi. Costacurta made his first Serie A appearance on 25 October 1987 against Hellas Verona on the sixth matchday of the season. Milan would go on to win the match 1–0, as well as the Serie A title, but Costacurta received limited playing opportunities that season, due to the presence of the more experienced Filippo Galli in his position. Overall, Costacurta managed 7 appearances in Serie A, and one appearance in the Coppa Italia that season. The 1988–89 season would see Costacurta gain more playing opportunities and appear more frequently for the club, as he would feature in Milan's 3–1 win over Sampdoria in the 1988 Supercoppa Italiana. He would make 26 appearances in Serie A that season, and would also win his first European Cup title after Milan defeated Steaua București 4–0 at the Camp Nou, Barcelona. Costacurta played the first 74 minutes of the final before being substituted by Filippo Galli. During the 1989–90 Season, Costacurta won his second consecutive European Cup with Milan, defeating Benfica 1–0 in the final in Vienna. He also featured in Milan's Intercontinental Cup win in Tokyo over Atlético Nacional, and in the European Supercup victory over Johan Cruyff's Barcelona. Costacurta also scored his first goal in Serie A during that season, in a 3–1 away defeat to Milanese rivals Internazionale in the Derby della Madonnina. Milan would also reach the Coppa Italia final that season. In Sacchi's final season at the club, Costacurta would become a starting centreback alongside Franco Baresi, as well as full-backs Mauro Tassotti and Paolo Maldini, in Sacchi's four-man defensive line, which is regarded as one of the greatest defences of all-time. [a] Costacurta would make 25 appearances in Serie A that season, and he would also win his second consecutive Intercontinental Cup and European Super Cup trophies. Under Capello's Milan, Costacurta continued to be a permanent member of the starting line-up, and he won four Serie A titles (including three consecutive titles in 1991–92, 1992–93 and 1993–94, as well as another title in 1995–96), a Champions League title in 1994, an UEFA Super Cup in 1994, as well as three consecutive Italian Supercups in 1992, 1993 and 1994. Milan also managed to reach three consecutive Champions League finals between 1992–93 and 1994–95. However, Costacurta missed the 1994 Champions League final win over Barcelona on 18 May because of a suspension, having been sent-off in the semi-final match against Monaco. Costacurta also helped Milan to win the 1991–92 Serie A title undefeated, as Milan went on an Italian record of 58 matches unbeaten. He also played a key role in Milan's defensive line in the 1993–94 title, by only conceding 15 goals all season, as Milan finished the season with the best defence in Italy. Following Capello's departure after the 1995–96 title win, as well as the aging and retirement of certain key players, Milan faced dark times in their history. Milan were defeated in the 1996 Italian Supercup Final by 1995–96 Coppa Italia winners Fiorentina, and the 1996–97 and 1997–98 seasons were negative, as Milan failed to qualify for Europe on both occasions. These fruitless seasons saw Milan undergo several managerial changes, including Tabárez, and the unsuccessful returns of Sacchi and Capello. However, Costacurta, through his leadership in defence, would help Milan reach the 1998 Coppa Italia Final, losing out to Lazio. With the arrival of Alberto Zaccheroni during the 1998–99 season, Costacurta continued to be a key member of the starting line-up, and featured in Zaccheroni's new three-man defence alongside Maldini and Luigi Sala. Costacurta was also named Milan's vice-captain that season, behind Maldini, following the retirement of Baresi and Tassotti. At the end of the season, Milan managed to capture their 16th Scudetto win, and Costacurta's sixth in total, finishing ahead of Lazio by a single point. However, the next two seasons would see Milan undergo yet another trophy drought. Milan would lose the 1999 Supercoppa Italiana to Parma, and would finish in third place in 1999–2000, and in a disappointing sixth place, outside of the Champions League spots, in 2000–01. Milan also suffered early eliminations in the first and second round of Champions League during those two seasons, and Zaccheroni would be sacked midway through the 2000–01 season, and replaced with Cesare Maldini as a temporary caretaker. For the 2001–02 season, Fatih Terim was appointed as Milan's coach, but after the first eight matches, and negative results, Costacurta's former Milan teammate Carlo Ancelotti was appointed manager. Ancelotti guided Milan to a fourth-place finish in Serie A, which allowed them to clinch the final UEFA Champions League qualifying spot, and ultimately qualify for the next season's Champions League. Ancelotti also helped Milan to their best ever UEFA Cup finish that season, reaching the semi-finals. Ancelotti's arrival and several new signings would bring about a new era of European and Italian dominance for Milan, and Costacurta would form part of another excellent defence, which included players such as Maldini, Alessandro Nesta, Jaap Stam and Cafu. At the end of the season, in 2002, Costacurta's contract was expiring – he therefore decided to leave the club at age 36 following their American exhibition tour in the summer to pursue a Master's in Economics in the United States. However, Milan lacked defenders in their squad due to injuries, and Adriano Galliani recalled Costacurta to renew his contract the night before the second leg of their crucial UEFA Champions League playoff match against Czech side Slovan Liberec. Milan qualified with difficulty, winning 1–0 in Milan, but being defeated 2–1 in the away match, progressing only on away goals. Milan finished third in Serie A that season, and Costacurta won his first ever Coppa Italia with the club, overcoming Roma in the final. Under Ancelotti, Costacurta would be employed at both centre-back and right-back during this season. Despite difficulties encountered in qualifying, Milan reached the Champions League final that season, in the first ever all-Italian final against Serie A rivals Juventus. On 28 May 2003, Milan captured the Champions League after defeating Juventus 3–2 on penalties following a 0–0 draw after extra time. Costacurta started the match at right back, and was substituted in the 65th minute, coming off for Roque Júnior. This was Costacurta's fourth career Champions League title. In the following season, Milan were defeated in the 2003 Supercoppa Italiana by Juventus on penalties. Milan defeated Porto 1–0 in the 2003 UEFA Super Cup final, but lost on penalties to Boca Juniors in the 2003 Intercontinental Cup final. Costacurta missed the decisive penalty in the shootout. However, Milan won the 2003–04 Serie A title with a record 82 points, with Costacurta, then aged 37, winning his seventh league title with Milan (only Virginio Rosetta, Giuseppe Furino, Giovanni Ferrari and Gianluigi Buffon have more Serie A titles, with eight titles each). In 2004, Costacurta was elected 50th in the UEFA Golden Jubilee online poll, which celebrated the best European footballers from the past 50 years. Costacurta began the 2004–05 Serie A season winning his fifth Supercoppa Italiana after Milan defeated Lazio. Milan would finish the season in second place in a closely fought title race against Juventus. Milan would also suffer a huge disappointment in the UEFA Champions League. Milan reached the 2005 Champions League final in Istanbul as heavy favourites over Liverpool. At half-time, Milan were leading 3–0, but Liverpool made a second half comeback, scoring three goals to tie the match and send it into extra time. Liverpool ended up winning the title in the resulting penalty shootout in what became known as "The Miracle of Istanbul". Milan reached the semi-finals of the 2005–06 UEFA Champions League, only to be eliminated disappointingly by eventual champions Barcelona. Milan also finished second in Serie A behind Juventus that season, for the second consecutive season. However, both teams were found to be guilty of being involved in the 2006 Italian match-fixing scandal, and received point deductions. Juventus were relegated to Serie B, and Milan ended up finishing in third place, while the Scudetto was assigned to Internazionale. 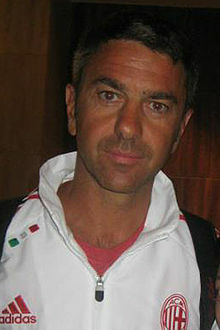 Costacurta was set to retire from Milan at the end of the 2005–06 season, but later signed a one-year extension at age 40. On 21 November 2006, he became the oldest footballer ever to play in the Champions League, in Milan's 1–0 loss to AEK Athens, at 40 years and 213 days, topping the previous record held by Belgian goalkeeper Dany Verlinden at 40 years and 116 days. Costacurta's record was later broken by Marco Ballotta, who on 11 December 2007, played a match at age 43 years and 253 days in Real Madrid against Lazio. Costacurta began his final professional season with the club at age 40. During the season, he won his fifth UEFA Champions League title with Milan. On 7 May 2007, at age 41, he announced his retirement, effective at the end of the 2006–07 season. He remained with the club as a second assistant to manager Carlo Ancelotti for a short time afterwards. He made his final home start in Milan's 3–2 loss to Udinese on 19 May 2007, converting a penalty that marked his first Serie A goal since the 1991–92 season (15 years after his left-footed volley against Roma on 3 November 1991), and left the pitch near the end of the match to a standing ovation. With this goal, he became the oldest goalscorer in Serie A, at the age of 41 years and 25 days, surpassing the previous record held by Silvio Piola, who in Novara–Milan, on 7 February 1954, scored a goal at 40 years, six months and nine days. Costacurta also became the oldest outfield player to play in a Serie A match. The only players to have played in a match at a more senior age were goalkeepers Marco Ballotta (44 years and 38 days), Alberto Fontana (41 years and 297 days), Francesco Antonioli (41 years and 243 days) and Dino Zoff (41 years and 76 days). After the match, Costacurta's Milan teammates entered the pitch wearing a replica of his jersey as a tribute. With Milan, Costacurta won the Scudetto seven times and the European Cup/UEFA Champions League five times, in 1989, 1990, 1994, 2003 and 2007, although he did not feature in the squad for the 1994 and 2007 finals. Costacurta also won a Coppa Italia, five Supercoppa Italiana, four UEFA Supercups and two Intercontinental Cups with Milan. He also managed to reach three more UEFA Champions League finals, wherein Milan lost to Marseille in 1992–93, Ajax in 1994–95 and Liverpool in the 2004–05, with a total of eight finals reached and five won. He also reached two more consecutive Intercontinental Cup finals, where Milan were defeated 3–2 by São Paulo in 1993 and 2–0 by Vélez Sársfield (where Costacurta was sent off in the 85th minute) in 1994, as well as losing out on the 1993 UEFA Super Cup to Parma under Fabio Capello, and the 2003 Intercontinental Cup to Boca Juniors under Carlo Ancelotti. Costacurta made 662 appearances for Milan throughout his career (458 in Serie A, 78 in the Coppa Italia, 108 in European Competitions, 5 appearances in the Intercontinental Cup final, 6 in the Italian Super Cup final, and 7 in the UEFA Super Cup final). He only scored three goals in Serie A, with his first coming in a 3–1 defeat in the Milan–Inter derby on 13 March 1990. The second came in a 4–1 over Roma at the San Siro, on 3 November, where he scored the fourth goal of the match, and his final goal was scored in a 3–2 defeat to Udinese on the final match of his career. Costacurta is the third highest appearances holder for Milan in official matches, with 662 caps; only Franco Baresi (719) and Paolo Maldini (902) have managed more appearances. Between 1986 and 1990, Costacurta made eight appearances with the Italian under-21 side, participating in two European Championships in 1988, where Italy reached the quarter-finals, and in 1990, where Italy reached the semi-finals. A mainstay in the Italy national team throughout the 1990s, Costacurta played for his country in three major tournaments: the 1994 and 1998 World Cups, as well as Euro 1996. He received his first senior call-up under Azeglio Vicini on 22 December 1990, but he made his debut for the senior team on 13 November 1991, at age 25, in a 1–1 draw against Norway in Genoa. He later became a regular first-team member under his former Milan coach Arrigo Sacchi, who replaced Vicini in 1991 after Italy failed to qualify for Euro 1992 in Sweden. Costacurta scored his first goal for Italy on 4 June 1992 from a penalty in a 2–0 against the Republic of Ireland during Italy's U.S. Cup run, where they finished in second place to the host nation in the friendly tournament. Costacurta was a starting member in Italy's defensive line at the 1994 World Cup. He helped Italy reach the final, putting in strong defensive performances alongside Milan teammate Paolo Maldini, in particular following fellow Milan centre-back Franco Baresi's injury, and fellow Milan right-back Mauro Tassotti's suspension. He notably helped a ten-man Italy to keep a clean sheet in their second group match against Norway. However, after missing out on the 1994 Champions League final through suspension, he also missed the 1994 World Cup final loss on penalties to Brazil, again due to suspension, after receiving a yellow card in the semi-final match against Bulgaria. Costacurta started in Euro 1996 for Italy, as they were eliminated in the first round, in a group with the two eventual finalists, the Czech Republic and Germany. Costacurta was once again a key member of Italy's defence in the 1998 World Cup under manager Cesare Maldini, starting in all five of Italy's matches and helping the team to keep three clean sheets. Italy were eliminated in the quarter-final to hosts and eventual champions France, on penalties once again, after a 0–0 draw following extra time. Despite Dino Zoff's intention to use him in the Italy squad for the Euro 2000 qualifying campaign, Costacurta retired from international duty in 1998, with 59 caps and two goals, after Italy's elimination from the World Cup. Costacurta is regarded by many pundits, managers and players as one of the greatest defenders in history; he formed some of the most formidable defensive units of all time during his extensive career at Milan, alongside defenders such as Paolo Maldini, Franco Baresi, Mauro Tassotti, Filippo Galli, Christian Panucci, Alessandro Nesta, Cafu and Jaap Stam. Costacurta was a tactically versatile defender who excelled anywhere along the backline, which allowed him to have a long and highly successful career, both at club level and with the national side, winning many trophies. Although he was primarily played as a centre-back alongside Baresi throughout his career, he also occasionally played as a sweeper, as a full-back on either flank, and even as a defensive midfielder. Costacurta was a complete, hard-working and experienced defender who was also gifted with good distribution and crossing ability, as well as a solid technique and first touch, despite not being the most skilful player on the ball, which enabled him to be comfortable in possession and start attacking plays from the back-line. He was a tenacious yet disciplined defender with fast reactions who was known in particular for his exceptional tactical intelligence as well as his timing and strong, precise tackling ability. He was also quick-thinking, mobile, effective in the air, and had an outstanding ability to read the game and anticipate plays, despite his lack of notable pace, physical strength or athletic attributes, due to his slender build. He was an extremely precise and attentive footballer who excelled both at man marking as well as in a zonal marking system, due to his excellent positional and organisational sense, communication, awareness and his ability to play the offside trap effectively. Despite being a defender, he was an accurate penalty taker who often took penalties for his team in shoot-outs. He also stood out for his class, leadership and professionalism on the pitch, as well as his longevity throughout his career. In July 2014, compatriot and 2006 Ballon d'Or winner Fabio Cannavaro described Costacurta as the best defender with whom he had ever played. After his retirement, in 2007–08 Costacurta was a member of Carlo Ancelotti's coaching staff at Milan as a technical assistant, while earning his own coaching badges. At the end of the season, he successfully earned his badges and various Italian media reported that he was pursuing a managerial role of his own. However, he refused a position at Pisa offered by new club owner Luca Pomponi immediately after the completion of his takeover of the club, citing his need to remain at Milan in order to stay at home and take care of his son while his wife was on tour with the theater. On 27 October 2008, Costacurta was unveiled as new coach of Serie B promotion candidates Mantova, then 13th in the table, following the dismissal of previous boss Giuseppe Brucato. However, his time at Mantova proved to be unsuccessful, as he failed to improve Mantova's results and ultimately leading him to tend his resignation from the coaching post following a 1–0 loss to Vicenza that left his club only four points above the relegation zone. Costacurta is married to former Miss Italia Martina Colombari, and has one son, Achille. Costacurta is known for his vocal criticism of homophobia and discrimination against women. In a 2012 interview with Italian newspaper Il Corriere della Sera, he stated that footballers should be allowed to be open about their sexuality. ^ a b c "Addio al calcio giocato di Billy Costacurta" (in Italian). Retrieved 25 July 2014. ^ a b c "Tanti auguri a Billy Costacurta, uno dei fondatori della patria". Retrieved 25 July 2014. ^ a b "Milan sconfitto dall'Udinese Costacurta lascia con un gol". La Repubblica (in Italian). 19 May 2007. Retrieved 25 July 2014. ^ a b "Costacurta "donna" per un giorno "Gay? L'outing di un campione aiuterebbe"". Il Corriere della Sera (in Italian). 19 September 2012. Retrieved 20 January 2015. ^ a b c d e f g h i j k "Alessandro COSTACURTA ("Billy")". magliarossonera.it (in Italian). Retrieved 12 January 2015. ^ Foot, John (2006). Winning at All Costs: A Scandalous History of Italian Soccer. New York: Nation Books. p. 228. Retrieved 10 March 2016. ^ Corrado Sannucci. "MILAN 1988–1994: 6 ANNI DA CAMPIONI". Storie di Calcio (in Italian). Retrieved 10 March 2016. ^ a b c d e f g "A.C. Milan Hall of Fame: Alessandro Costacurta". acmilan.com. A.C. Milan. Retrieved 21 July 2014. ^ "Alessandro Costacurta: Biografia". Archived from the original on 19 July 2014. Retrieved 25 July 2014. ^ "L'estate da disoccupato di Billy Costacurta". Archived from the original on 14 June 2014. Retrieved 25 July 2014. ^ a b "Al Milan anche la Coppa Italia". La Repubblica. Retrieved 25 July 2014. ^ "UEFA Awards". rsssf.com. Retrieved 17 April 2015. ^ "UEFA Champions League Records and Statistics" (PDF). Retrieved 25 July 2014. ^ "Silvio Piola, il più bomber di tutti". Archived from the original on 14 July 2014. Retrieved 2 July 2014. ^ a b c d "Nazionale in cifre: Alessandro Costacurta". figc.it (in Italian). FIGC. Archived from the original on 18 April 2015. Retrieved 17 April 2015. ^ Gianni Mura (18 July 1994). "Sconfitti, a testa alta". La Repubblica (in Italian). Retrieved 17 April 2015 – via storiedicalcio.altervista.org. ^ Giancarlo Padovan (24 June 1994). "L'Italia forza 10 si scatena". Il Corriere della Sera (in Italian). Retrieved 17 April 2015 – via storiedicalcio.altervista.org. ^ Giancarlo Padovan (14 July 1994). "Roby Baggio ci porta in Paradiso". Il Corriere della Sera (in Italian). Retrieved 17 April 2015 – via storiedicalcio.altervista.org. ^ "1996: GERMANIA". La Storia dei Campionati Europei di Calcio (in Italian). Retrieved 17 April 2015 – via storiedicalcio.altervista.org. ^ Lodovico Maradei (4 July 1998). "Francia avanti, ancora rigori stregati". La Gazzetta dello Sport (in Italian). Retrieved 17 April 2015 – via storiedicalcio.altervista.org. ^ "Bachini e Giannichedda le sorprese di Zoff". la Repubblica. Retrieved 23 July 2014. ^ a b Alberto Costa (2002). "COSTACURTA, Alessandro". Treccani: Enciclopedia dello Sport (in Italian). Retrieved 14 November 2016. ^ "The top 20 most under-rated footballers of all time". The Telegraph. 2 April 2015. Retrieved 14 November 2016. ^ a b c Enrico Currò (24 May 1998). "Bergomi e il calcio antico Ma il libero serve sempre". La Repubblica (in Italian). Retrieved 14 November 2016. ^ a b "Milan Legends: "Billy" Costacurta". Retrieved 21 July 2014. ^ a b c Roy Hodgson (4 October 1997). "Football: Italy from Albertini to Zola". The Independent. Retrieved 24 January 2017. ^ "Coppa Italia, Milan-Chievo pareggio a reti inviolate". La Repubblica (in Italian). 14 January 2003. Retrieved 1 February 2017. ^ "Inter e Milan indigeste alla Juve". La Gazzetta dello Sport (in Italian). 27 July 2004. Retrieved 1 February 2017. ^ a b c Licia Granello (27 June 1994). "I CONSIGLI DI BARESI ' BAGGIO REAGISCI'". La Repubblica (in Italian). Retrieved 14 November 2016. ^ ROBERTO BECCANTINI (26 March 2003). "SALTO TRIPLO I ROSSONERI SUPERANO I VIOLA (PASSATI IN VANTAGGIO CON TONI), AVVICINANO LA JUVE E SALGONO A PIU' 5 SULL'INTER. E ADESSO C'E' LA CHAMPIONS" (PDF). La Stampa (in Italian). p. 31. Retrieved 1 February 2017. ^ a b c d "Cannavaro su Costacurta: 'Il migliore con cui abbia giocato'". Calcio Mercato (in Italian). Retrieved 21 July 2014. ^ "Dream Teams: AC Milan – Defender: Alessandro Costacurta". The Independent. Retrieved 21 July 2014. ^ Max Cristina (15 January 2015). "Il fuorigioco fa 90 anni: "Oggi è più difficile, ma per farlo serve mentalità offensiva"" (in Italian). Sport Mediaset. Retrieved 1 February 2017. ^ Marco Bucciantini (24 March 2015). "Sacchi l'idealista e il "suo" Milan" (in Italian). Treccani. Retrieved 1 February 2017. ^ Massimo Arcidiacono (24 April 2006). ""Magico Costacurta È cresciuto con noi"". La Gazzetta dello Sport (in Italian). Retrieved 1 February 2017. ^ Enrico Currò (30 May 2003). "Il calcio incorona Ancelotti Tutta la vita in un rigore". La Repubblica (in Italian). Retrieved 1 February 2017. ^ "QUEL RIGORE (DOPPIO) TROPPO ATTESO". La Repubblica (in Italian). 14 February 1994. Retrieved 1 February 2017. ^ Marco Foroni (25 June 2012). "I rigori dalla A alla Z" (in Italian). Sport Mediaset. Retrieved 1 February 2017. ^ Stefano Olivari (28 June 2013). "L'Italia del rigore" (in Italian). Il Guerin Sportivo. Retrieved 1 February 2017. ^ "Costacurta dice no, il Pisa torna su Ventura" (in Italian). Il Tirreno. 15 July 2008. Retrieved 27 October 2008. ^ "Costacurta takes over Mantova reins". RTÉ. 27 October 2008. Retrieved 29 August 2014. ^ "COMUNICATO STAMPA: Costacurta si è dimesso" (in Italian). AC Mantova. 9 February 2009. Archived from the original on 9 June 2009. Retrieved 9 February 2009. ^ Sibor, Doug (3 January 2013). "25. Martina Colombari". Complex.com. Archived from the original on 28 July 2013. Retrieved 19 February 2013. ^ "Alessandro Costacurta". National Football Teams. Benjamin Strack-Zimmerman. "Costacurta to assist Ancelotti on Milan bench – sports.filbalad.com, 5/7/07". Archived from the original on 27 September 2007. Retrieved 21 May 2007.